Concert promoters Cloud 9 Adventures and The Bowery Presents have partnered up to create a new tropical destination concert experience called The Avett Brothers at the Beach. With the award-winning folk-rock group headlining the event, the concert vacation will take place in the Riviera Maya region of Mexico, a beautiful, scenic location that is also the site of the Hard Rock Hotel Riviera Maya, the home of the four-night, all-inclusive event. 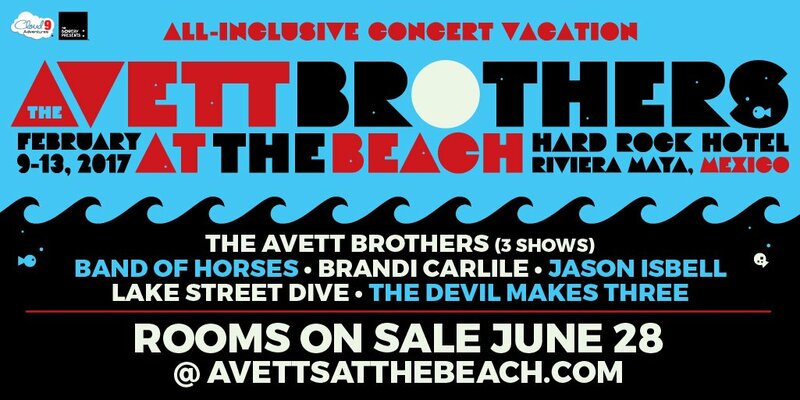 Apart from the Avett Brothers performing three full shows throughout the trip, they will be joined by other illustrious bands, including Band of Horses, Lake Street Dive, The Devil Makes Three, Brandi Carlile and Jason Isbell, who are each scheduled to have one set during the four-night stay. On top of the multiple concerts scheduled to take place every night, there is also a full schedule of daytime events that allow attendees to take full advantage of the spectacular, historic setting of Riviera Maya, including events hosted by the visiting artists, outdoor activities and off-site and historical excursions that encompass everything from archaic ruins to ziplining. Guests of At the Beach will also be encouraged to participate in a day of service in partnership with the charity Positive Legacy, which seeks to unite live music and altruism, urging artists and fans to participate in a day of cultural connection with the local community as a way of giving back. The event will also feature a donation drive and fundraising auction, for which all proceeds will go towards local school children and future charitable projects of the organization. The Avett Brothers have a busy year ahead of them, with their much-anticipated forthcoming album True Sadness slated for release next week on June 24, and undoubtedly a tour will be soon to follow on top of this exhaustive destination-concert event, which is scheduled for Feb. 9-13, 2017. Tickets and packages go on sale starting June 28 at noon EST here, and True Sadness is available for preorder here.